The GM Ecotec engine, also known by its codename L850, is a family of all-aluminium inline-four engines, displacing between 1.4 and 2.5 litres. While these engines were based on the GM Family II engine, the architecture was substantially re-engineered for the new Ecotec application produced since 2000. This engine family replaced the GM Family II engine, the GM 122 engine, the Saab H engine, and the Quad 4 engine. It is manufactured in multiple locations, to include Spring Hill Manufacturing, in Spring Hill, Tennessee. 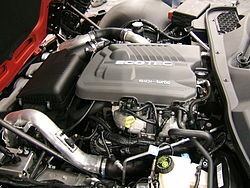 The ' Ecotec' name was adopted in 1994 for the new generation of Family II engines (2000 in North America) . The name was already used for the Opel GM Family II engine, Family 1 and Family 0 ranges. GM intends this new Ecotec to become its global 4-cylinder, and it has already fully replaced their OHV I4 line. The Ecotec engine is a DOHC 4-valve design with a lost foam cast aluminum block and head (L850 for 86 mm bore applications, and L880 for 88 mm bore[ citation needed]), designed for displacements from 1.8 to 2.4 L. Development began in 1994, by an international team of engineers and technicians from Opel's International Technical Development Center in Rüsselsheim, Germany, GM Powertrain in Pontiac, Michigan, and Saab in Södertälje, Sweden. Much of the development work on this project was carried out by Lotus Engineering, Hethel, United Kingdom. The engine uses aluminum pistons and cast iron cylinder liners. Vibration is reduced with twin balance shafts. This engine is also known as B207 when used by Saab and Z20NET by Opel for use in the Vectra C and Signum. LK9 is a turbocharged 2.0 L— 1,998 cc (121.9 cu in)—version of the L850 (86 mm bore) series Ecotec utilizing an all-new reinforced sand cast aluminum cylinder head and upgraded internal components. The exhaust valves are liquid sodium-cooled. All vehicles using this engine feature Saab's Trionic 8 (T8) engine management system as well as a revised valve train. The timing chain and timing gears are also new, along with Saab's Direct Ignition system. The reinforcements, turbocharging, intercooling, internals, dual overhead camshaft, and such were developed by GM Powertrain Sweden (Saab Automobile Powertrain). It features an 86 millimetres (3.4 in) bore and stroke and a 9.5:1 compression ratio. Maximum power is 210 horsepower (160 kW) at 5300 rpm and 221 ft⋅lb (300 N⋅m) of torque at 2500 rpm. Maximum boost is 12.3 psi (0.85 bar). The LSJ is a supercharged version of the LK9 Ecotec 2.0 L— 1,998 cc (121.9 cu in)— with an Eaton M62 Roots-type supercharger and air-to-liquid intercooler. The LSJ shares many of its components with the LK9 such as: piston cooling jets, oil cooler, pistons, connecting rods, crankshaft, oil pan, sodium-filled exhaust valves and cylinder head. It is rated at 205 hp (153 kW) at 5600 rpm and 200 ft⋅lb (271 N⋅m) at 4400 rpm with a compression ratio of 9.5:1 and a 6500 rpm redline. With the end of the Chevy Cobalt S/C SS and Saturn Ion Red Line, the LSJ was discontinued after 2007. In late 2005 Brammo Motorsports struck a deal with GM for the Supercharged 2.0 L Ecotec for their Ariel Atom. The engine came in various ratings from 205 hp (153 kW) to 300 hp (220 kW). This engine is also known as a Z22SE in other countries such as the United Kingdom, Australia, and Europe. The Ecotec 2.2, model L61 first appeared in the 2000 Saturn LS1; the L61-powered Saturn Ion also replaced the Saturn-powered Saturn S-Series. There are a few variations to the standard L61. The 2003 Saturn L-Series has a high output version with higher (10:1) compression and more aggressive camshaft. The 2004–2008 Chevrolet Malibu uses a version with electronic throttle control and a special unitized exhaust manifold and catalytic converter. The Malibu and Saturn versions also use return-less fuel injection. The 2002 Saturn VUE was the first North American variant of the L61 to be equipped with electronic throttle control, whereas other applications did not arise until 2005 in the Saturn ION and Chevrolet Cobalt. For 2007, introduced an updated version of the L61 based on the Gen II design. The supercharger and inlet manifold from the 2.0 Ecotec LSJ engine can be purchased as an official kit from GM and along with modified software in the ECM, can create a 2.2 supercharged version of this engine. A turbocharged direct injected (redubbed Spark Ignition Direct Injection) Ecotec was introduced in the 2007 Pontiac Solstice GXP and Saturn Sky Red Line. In these applications, the engine is mounted longitudinally. Displacement is 2.0 L—1,998 cc (121.9 cu in)—with a square 86 millimetres (3.4 in) bore and stroke. Compression is 9.2:1 and maximum boost is 1.4 bar (20.0 psi), delivering 260 hp (190 kW) at 5300 rpm and 260 ft⋅lb (350 N⋅m) of torque from 2500 to 5250 rpm. Engine redline is at 6300 rpm and premium fuel is recommended. The sodium filled exhaust valves were based on technology developed for the Corvette V8 powertrains. The sodium fuses and becomes a liquid at idle, which improves conductivity and draws heat away from the valve face and valve guide towards the stem to be cooled by the engine oil circulating in this area. The camshaft-driven direct injection systems pressurizes the fuel to 31 bar (450 psi) at idle, and up to 155 bar (2,250 psi) at wide-open throttle. The "Gen II" block is similar to the 2.4 L and also features VVT technology. The Gen II block was developed using data from racing programs and computer simulations. The bore walls and bulkheads were strengthened with a weight increase of 1 kg (2.5 pounds). The coolant jackets were expanded to improve heat transfer, resulting in a coolant capacity increase of 0.5 liters. This was the final Stage 2 performance tune the Ecotec family, to date. With the demise of the GM Performance Division, performance tunes like this have been relegated to the aftermarket sector. This despite newer engines being more durable, and tuned to lower horsepower levels in numerous sport-car applications. An updated variant of the LNF (also with 9.2:1 compression ratio) was released in 2008, meeting the Euro 5 emission standard. This engine is also known as A20NHT by GM Powertrain Europe. LHU adds E85 flex-fuel capability to the LDK. This engine is also known as A20NFT by GM Powertrain Europe. Maximum engine speed is listed at 6350 RPM. Note: The A20NFT engine in Opel Astra K TCR car had swapped the original direct fuel injection into multi-point fuel injection. In 2007, the L61 received a multitude of changes, that originated from the LE5. It switched to the higher-strength Gen II block and received a revised cylinder head (enlarged exhaust ports) and camshaft design (increased exhaust valve duration). The engine also switched from wasted spark ignition to individual coil-on-plug ignition, this forced the cam cover to be redesigned. It was also switched to an E37 engine controller with new crank and cam sensors (replacing timing sensor previously found in ignition cassette). These changes increase horsepower slightly and allow the engine to meet PZEV standards. Compression ratio is 10.0:1. The LAP is a 2.2 L—2,198 cc (134.1 cu in)—version of the Ecotec, based on the Gen II block with cylinder head improvements, new camshaft design, E37 engine control module, 58X crankshaft reluctor ring, dual variable valve timing, digital crank and cam sensors, individual coil-on-plug ignition, vented starter solenoid, new MAP sensor, new intake manifold seals, new oil filter element, a 32-bit computer, and improved emissions performance. Bore and stroke are 86 mm (3.4 in) and 94.6 mm (3.72 in), the same as the 2.2 L L61. Compression ratio is 10.0:1. Major features that set it apart from the 2.2 L L61 are variable-valve-timing and other cylinder head improvements from the 2.4 L LE5. The LE8 is an E85 compatible 2.2 L—2,198 cc (134.1 cu in)—version of the LAP Ecotec. Bore and stroke remain the same 86 mm (3.4 in) and 94.6 mm (3.72 in). Compression ratio is 10.0:1 and the engine can run on both regular unleaded gasoline or E85. The LAT is the designation used for the 2.4 L LE5 when used in GM's BAS mild hybrid vehicles. The LE9 is an E85 compatible version of the 2.4 L—2,384 cc (145.5 cu in)—LE5 Ecotec. Bore and stroke are 88 mm (3.5 in) and 98 mm (3.9 in) and has a compression ratio of 10.4:1, the same as the LE5. The LEA is an E85 compatible variant of the LAF. Bore, stroke, and compression ratio all remain the same. Maximum engine speed is listed at 7000 RPM. The LUK is similar to the LAF, but adds the eAssist mild-hybrid system. Maximum engine speed is listed at 7000 RPM. 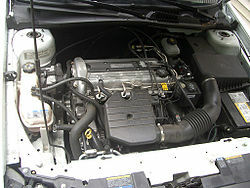 A 2.0 L (1998 cc) turbocharged direct injection version of the gen III Ecotec was available in the 2013 Cadillac ATS and Chevrolet Malibu. This engine is also available in the Cadillac XTS and Cadillac XT5 in the Chinese market. Bore and stroke are both 86.0 millimetres (3.39 in), and compression is 9.5:1. The engine uses a twin-scroll turbocharger with electronically controlled wastegate/bypass valve, air-to-air intercooler, stainless steel dual-scroll (1–4, 2–3) exhaust manifold designed to withstand 980 °C (1,800 °F) turbine temperature, and a rotacast aluminum alloy (A356T6) cylinder head with sodium-filled exhaust valves. Maximum engine speed is listed at 7000 RPM. First appearing in the 2013 Chevrolet Malibu and 2013 Cadillac ATS, the 2.5 L Gen III block has been reworked to reduce engine noise and vibrations, while improving fuel economy and low-end torque. LCV is scheduled to replace the direct-injected 2.4 L throughout North American GM products within a year. Engine production started in April 2012 at GM's Tonawanda Engine plant. The new combustion system developed with GM's proprietary computational fluid dynamics (CFD) analysis software features a higher compression ratio which helps improve fuel efficiency and has improved knock resistance. 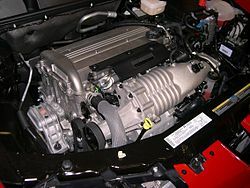 The engine features dual overhead camshafts with continuously variable valve timing and increased-authority cam phasing (increased phase rotation angle), a high-pressure returnless direct-injection fuel system with camshaft-driven fuel pump delivering 750 psi at idle and 2250 psi at full load, higher-flowing intake and exhaust ports in the cylinder head, electronic throttle control and pistons with jet-spray oil cooling. The engine redline is 7000 rpm. The balance shafts are relocated from the cylinder block to oil pan module. The two-piece steel-aluminum oil pan features in-pan integrated oil-pump assembly driven by the balance shaft with a shorter inverted-tooth chain. 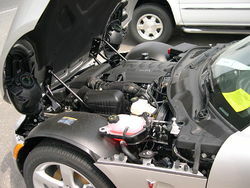 Other improvements include inverted-tooth chain driving the camshaft, forged steel crankshaft, cast aluminum bedplate with main bearing cap inserts made of iron, high-pressure fuel rail with rubber-isolated assembly, acoustically shielded plastic cover for the intake manifold, and structurally enhanced aluminum camshaft cover and front cover. These improvements helped reduce noise intensity by 40% compared to the 2.4 L engine and change the noise signature into a higher frequency above 2,000 Hz. The engine also uses a variable-displacement oil pump and an actively controlled thermostat. Direct injection reduces emissions by 25%, while continuous cam phasing eliminates the need for an EGR system. Maximum engine speed is listed at 7000 RPM. Displacement for the 2.5 L engine is 2,457 cc (149.9 cu in) with an 88.0 millimetres (3.46 in) bore and 100.8 millimetres (3.97 in) stroke. Compression ratio is 11.3:1. Same as the LCV but features Intake Valve Lift Control (IVLC) system provides two-stage variable valve lift in addition to continuous variable timing. Continuously commanded by engine control unit, the valve rocker arm switches between high-lift and low-lift profiles on the camshaft, actuated by an oil control valve through a two-feed stationary hydraulic lash adjuster, allowing for either 4.0 or 10.5 mm lift. It also features a start-stop system. Maximum engine speed is listed at 7000 RPM. 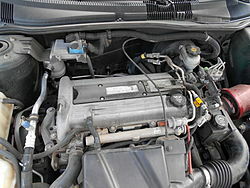 Wikimedia Commons has media related to Ecotec engine. ^ a b c d e f g h i "GM's Ecotec 2.2-Liter 4-Cylinder Engine Delivers". The Auto Channel. Pontiac, Michigan. Retrieved 15 March 2013. ^ "検索結果: 2001年　スバル　トラヴィック　Sパッケージ" [Great Car Pavilion: 2001 Subaru Traviq S-package]. Gazoo.com (in Japanese). Toyota Motor Corporation. Archived from the original on 2008-10-11. Retrieved 2012-05-22. ^ Chris Shunk RSS feed. "GM releases turbo upgrade kit for Solstice GXP, Sky Redline and HHR SS". Autoblog.com. Retrieved 2012-01-24. ^ "Big Power, Small Package". AutoWeek. Retrieved April 4, 2006. ^ "2012 Buick Regal GS rated at 270 hp". Autoweek. 2011-06-15. Retrieved 2012-01-24. ^ "2008 Ecotec 2.2L I4 ( L61 )". Retrieved 30 July 2014. ^ "NAIAS 09: 2010 ECOTEC 2.4l SIDI". Gminsidenews.com. Retrieved 2012-01-24. ^ Roth, Dan (2008-12-17). "DI FTW: GM unveils new direct-injection 2.4 L EcoTec and 3.0 L V6". autoblog.com. Retrieved 2008-12-17. ^ "Buick Introduces The All-New 2012 Verano". Media.gm.com. 2011-01-06. Retrieved 2012-01-24. ^ General Motors Europe (May 2008). "A Look Into the Future of Engines and Transmissions". CONTROLLED AUTO-IGNITION HCCI. ^ "HOMOGENEOUS CHARGE COMPRESSION IGNITION – HCCI". media.gm.com. Retrieved 30 July 2014. Larry Webster. "Getting Rid of the H-Word". Car and Driver (May 2000): 93.